 Celebrity owned restaurants are often dismal mistakes . Anyone remember Planet Hollywood? 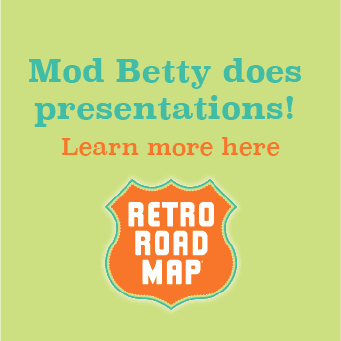 But when the place is owned and run by the son of “Leave It To Beaver's” TV mom Barbara Billingsley you gotta go! 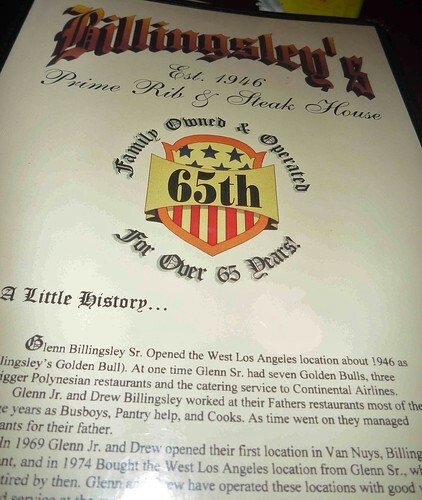 Located on Pico Blvd on the West Side of Los Angeles, Billingsley's has been serving top notch prime rib and steaks since 1969. When I first moved West 15 years ago, my long time pal Dennis Diken, the drummer for The Smithereens, presented me with a list of places I had to go. Had to. At the top of the page was Billingsley's. 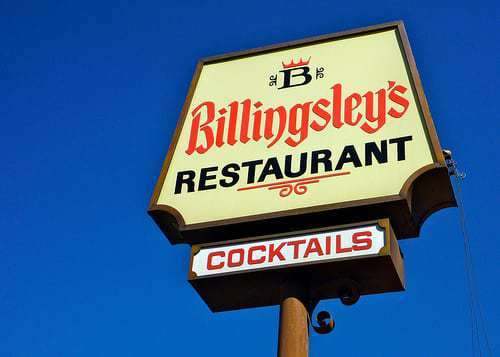 One trip there showed me that Billingsley's wasn't just at the top of the list because the letter B came second in the alphabet. 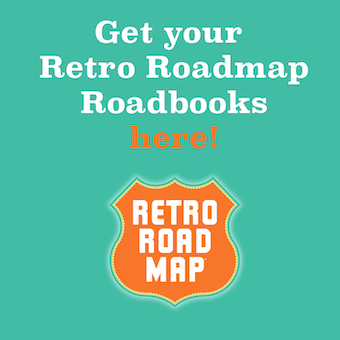 Originally they had two locations, the one on Pico and one in the San Fernando Valley. The valley location became a monthly go to for me. After all it was less than 5 miles from my home. Plus it was the epitome of old school cool. 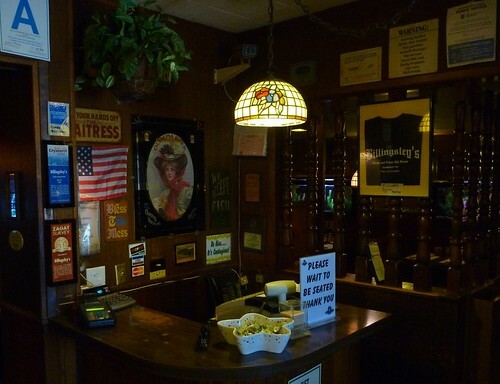 Located on an old run down golf course it was an oasis of fun and meat for my family and I. Plus they had an ancient gentleman who played organ standards in the main dining room on the weekends during the dinner rush. Which was at 5pm. 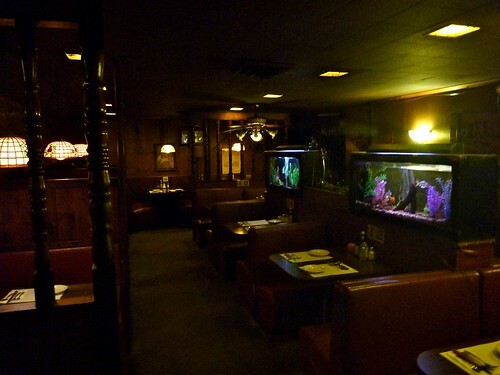 Eating delicious meals in big leather booths while listening to groovy versions of of “Girl From Ipanema” and “Witchcraft” with dozens of 80 year old couples was precious laugh out loud fun. Sadly, the golf course pulled the lease for that location some 7 years back (the space has remained empty since then.) This forced me to “Head West” to the Pico location any chance I got. Like this past week! 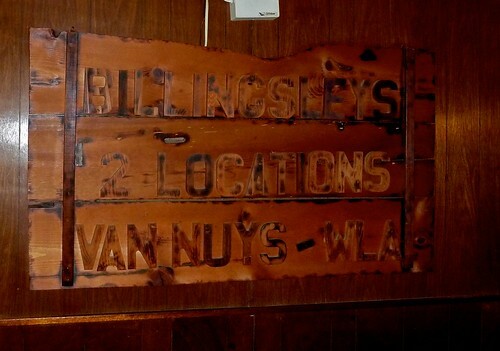 Now be warned--If you are allergic to wood paneling or old fish tanks then Billingsley's may not be the place for you. But who the hell is allergic to wood paneling and fish tanks? No one I need to know. The interior of the Pico restaurant is frozen in the swinging seventies. Perfect! The before mentioned walls and water are augmented with giant leather booths, random things strapped to the walls and tastefully done paintings of naked ladies. I may not know art, but I know what I like. The place is amazing! So perfect with kitsch filled details including a “Reading Library” outside the bathrooms and an area in the corner labeled “Disaster Area” that feature a pile of random dusty covered old junk. The lighting is perfectly dim and intimate. The waitress and barkeep have both been there for “Too long honey. Since the seventies.” Direct quote. And the food? Just as good. 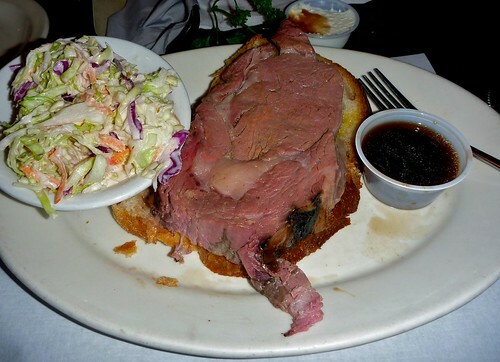 I had the “Prime Rib Sandwich ($16.95) which was completely misnamed. It was not a sandwich. It was a giant tasty slab of prime rib on top of a piece of sourdough bread. Sure you could call it “Open Faced” but to me it was just much much more. My plate was accented with some tasty fries and a sweet cole slaw made from scratch. My wife went for the French Dip ($9.95) an overstuffed french roll full of tasty sliced beef. So full she had to take half with her for later. For you “Heart Healthy” folks they have a wide range of salads and chicken choices—All served fresh and delicious. 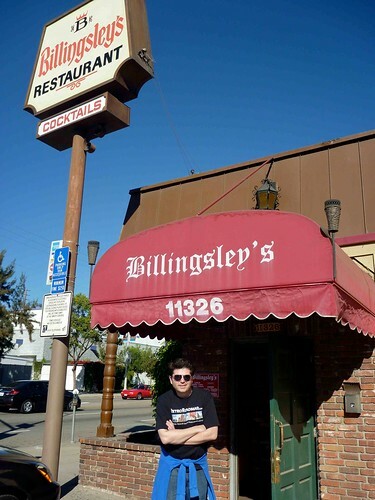 Billingsley's is a must visit for anyone visiting Los Angeles with a hunger for solid steaks and old school ambiance. Oh, and the manager wanted me to mention he is handsome. So there is that too.